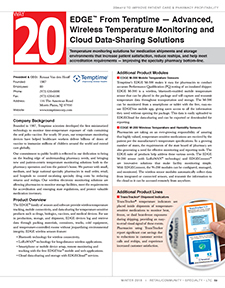 Monitor the storage temperature of sensitive materials and medications from anywhere without the need for servers or software. When pharmacies need to protect sensitive medications and vaccines, they turn to Primex Wireless. 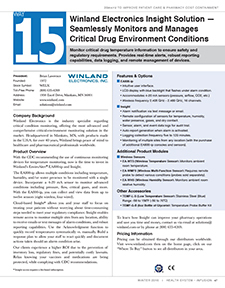 Our intelligent temperature and indoor-air-quality (IAQ) sensors make it easy to continuously monitor pharmacy assets with complete CDC compliance while ensuring the quality and safety for patients. Temperature and IAQ sensors set-up effortlessly and link through your existing Wi-Fi network to form a complete, continuous monitoring solution that automatically gathers all critical temperature, humidity and differential pressure information. Once collected, data transmits from the sensors back to a central software hub per your custom schedule. 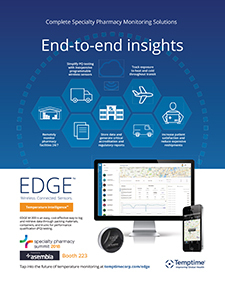 The proactive, intelligent network formed by the sensors and software is ideal for protecting the valuable assets of pharmacies of all sizes, from small, community pharmacies to the largest national chains. With a dedicated support specialist to help you configure your system, and durable devices built for years in the field, you can rest assured your Primex system will be on-guard 24/7/365. Protect patients, staff and sensitive resources with a monitoring and synchronized-time solution that easily pairs with your existing wireless network. Healthcare organizations of all types and sizes consistently choose Primex Wireless because our technology, service and support makes it drastically easier to maintain a safe, comfortable environment. 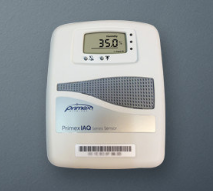 Your web-based Primex system will automate manual monitoring activities, alert you when conditions are out of range and provide documentation of conditions throughout every building, whether on a single campus, in a satellite clinic or even in another state. Key team members won�t get bogged down with data logging, maintenance and book-keeping; saving you and your staff hundreds of man hours each month. 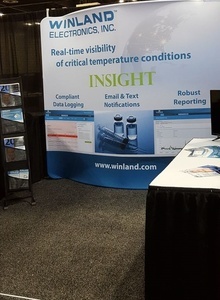 Count on Winland to monitor your environment-dependent assets and to ensure the vitality of your business and the quality of your reputation. As a healthcare professional, your primary concern is your patients. Time is critical and often in short supply�worrying about your equipment is not an option. Leave that to us! 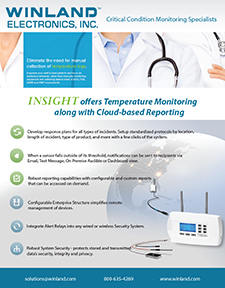 We offer the most comprehensive cloud-based alerting, reporting, and logging solutions available in the healthcare and pharmaceutical industries. Imagine an easy, affordable, and reliable way to protect your assets in just a few clicks! Unparalleled flexibility in configuring alert and device profiles. Organize by individual devices or groups of devices, individual stores or groups and/or types of stores, and geographically by location, region, or district. Our cutting-edge software features automated, real-time alerts and data collection to provide you with the fastest possible issue resolution. Our clients not only experience peace of mind, but also a higher ROI due to the prevention of inventory loss, regulatory fines, and potentially costly lawsuits. Further distinguish yourself in a competitive market and safeguard the quality of your products with Winland. Contact us today for more information! Rees Scientific specializes in protecting your valuable assets. Since 1982, Rees Scientific has been the industry standard for automated temperature monitoring. We offer continuous monitoring, centralized data collection, and simplified reporting. Monitor critical parameters such as temperature, humidity, differential Pressure, light control, etc. in vital equipment such as stability chambers, LN2 tanks, refrigerators, freezers, ultra-low freezers, incubators, etc. A single system can monitor a diverse facility with multiple locations while providing instant data access and sophisticated analysis right from your desktop computer, tablet or smartphone. Alarm notifications can be sent through telephone, text messages as well as e-mail. View sensor conditions of your unit right from the Rees Scientific LCD display module. Ideal for pharmacies that house vaccines in their refrigerators. Monitoring temperature of vaccines is a crucial task that is regulated by many different government health organizations. 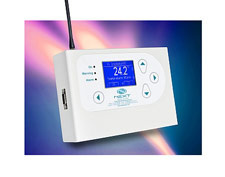 The Rees Scientific LCD module complies with the guidelines of vaccines storage and handling from CDC, NIH, NIST, AAP, and PHAC. Our LPA Cloud WiFi kits are a simple and economical way to monitor temperature in critical equipment such as refrigerators and freezers. The system will alarm out and notify when the temperature of a refrigerator or freezer fluctuates out of a given range. It is an ideal solution for laboratories, pharmacies, health clinics(Vaccine Temperature Monitoring) and food stores. Along with temperature, LPA Wireless also provides humidity and differential pressure sensors that help you become compliant with USP 797 regulatory requirements. Monitor 1, 2 or 6 inputs. View the status of your equipment from anywhere through an App or a browser. Full graphical overview of the system. Fully control and customize your menus. Today, we continue to lead the field, taking cues from our clients and their environmental challenges. We ensure that your critical equipment and devices are monitored and maintained to set a standard every day without exception and without fail. Rees Scientific will continue to build products and services that help provide resolutions for our customers. Our goal is to be a quality provider of systems, services and solutions for our clients. Tutela Monitoring Systems supply and install fully validated and compliant web-based temperature monitoring and recording systems. Tutela�s Genesis II System is designed specifically for hospitals, blood banks, plasma centers, laboratories, and pharmacies. The Genesis II System is the most evolved system yet from Tutela. It is completely scalable from a single fridge to a fully integrated multi-fixture system across multiple sites - all visible from an extremely intuitive web-based user interface. It is simple to use and accessible from anywhere in the world from any web-enabled device. At Tutela we understand how important your stored samples can be. Often they are a result of many years of research and, in most cases, irreplaceable. We take the necessary steps to provide you with the highest level of security. The system comes with an extensive power and battery back-up and all data records are stored on mirrored servers for 30 years. The Tutela Genesis II System is wireless, requiring little involvement from your IT department to integrate it into your everyday work environment. Through our vigorous data security protocols we give you unprecedented data security as well as easy access and control of your data records. Our system is guaranteed 100% compliant with all regulatory bodies and medical associations including FDA, MHRA, CPA, NHS, BBTS, NBS, GMP and NHSBT. The Genesis II System provides complete peace of mind with a 24/7 call bureau staffed by live personnel. You are notified of any deviation in your monitoring presets before it becomes a problem. The Tutela Genesis II System is truly unmatched by any competitor. Find out why Grifols Plasma Centers, WuXi AppTec, Gift of Life, Medline, University of Miami and Memorial Sloan Kettering Hospital, among many others worldwide have chosen the Genesis II System for their temperature monitoring needs. Tutela Systems is a division of �Next Controls Systems� providing temperature monitoring solutions in Europe and North America. Tutela Systems is an ISO9001:2008 company. tutela, next Controls Systems Energy Management Remote Sensing Services Off-Site Management Services Controls Maintenance Services Graphical Interface Systems next control systems. 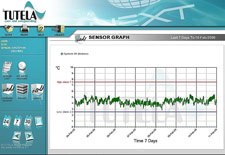 tutela web based monitoring system on Environmental Monitoring Systems Refrigerators & Refrigeration Systems and Wireless Temperature Monitoring Systems. automated temperature/facility monitoring monitoring/archiving e records and alarm notification service, hardwired and wireless sensor options. 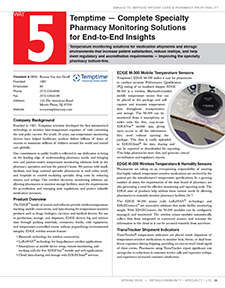 Find practical, proven solutions for Temperature Monitoring and management. 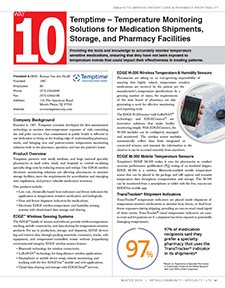 From medical-grade data loggers, temperature recorders and thermometers to portable refrigerators, medication warmers and more, HCL offers virtually everything imaginable to protect and secure temperature-sensitive medications throughout your facility. Enjoy wireless convenience to recorded temperature information with DataPad, a handheld touch screen device that allows users of EL-USB data loggers to download data and view results on the spot. 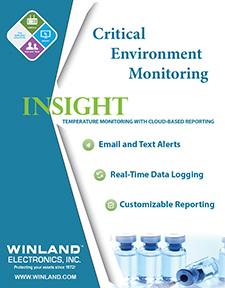 This convenient temperature monitoring tool eliminates the need to remove the logger from the refrigerator or freezer and take it to a computer to retrieve information. It also allows the full setup of loggers and configuration of units directly from the field. Refrigerator Locking Boxes keep supplies safe and secure and enable users to control access to temperature sensitive drugs while keeping them stored at a regulated temperature. 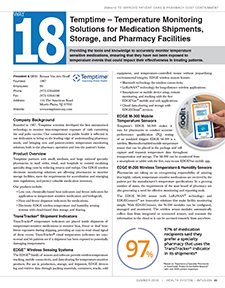 Achieve an additional layer of protection for refrigerated meds with Lockable Thermostat Covers that help control thermostat settings so only authorized personnel have access. Visit our site to learn more about our full inventory of Temperature Monitoring solutions. If you don�t find what you�re looking for, our talented team of product experts is ready to help! No Monthly Fees or Software Charges! Comark has a range of wireless temperature and humidity monitoring solutions offering economic and flexible systems for every measurement requirement including door event data. Advanced technology ensures high data integrity when data loss is not an option. Contact Comark for a complete list of parts including probes and accessories. Below is a list of our most popular components. RF513: Transmitter includes integral temperature and humidity sensors. RF515Kit: Sensor Transmitter can record & alert for 2 sensors using output of 4-20mA or 0 to 10 Volts. Probes are available in various lengths. Contact us for details. Data Memory is completely unaffected by loss of power in Gateways or battery change in Transmitters. Includes FREE backup software + FREE ongoing software upgrades, all downloadable from the web. Automated real-time backups, including one in CSV format. 1-hour backup battery for power loss notification via email, SMS or auto-dialer activation. Comark high quality, precision thermometers, pressure, airflow, humidity and pH meters, data loggers and wireless monitoring solutions for the food and pharmaceutical industries. Compliant with ISO9001:2000 RF500 wireless temperature monitoring manufacturer comark offers RF500 Wireless Monitoring and a range of economic and flexible systems for every temperature and humidity measurement requirement. Comark HACCP N5001 Auditor, hand held instrument for logging, monitoring and managing data, designed for use in HACCP, due diligence and health and safety systems. Comark wireless temperature monitoring systems, 4 Transmitter Options RF512, RF513, RF516, RF515. 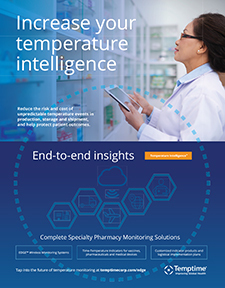 Temperature monitoring solutions for medication shipments and storage environments that increase patient satisfaction, reduce reships, and help meet accreditation requirements - improving the specialty pharmacy bottom-line. 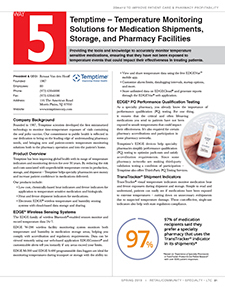 Electronic temperature and humidity monitoring solutions that meet emerging regulatory requirements and protect valuable medication inventory while in storage or transit. 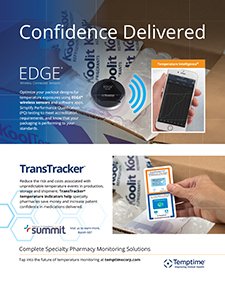 Temperature monitoring solutions for medication shipments and storage environments that increase patient satisfaction, reduce reships, and help meet regulatory and accreditation requirements - improving the specialty pharmacy bottom-line. Intelligent Temperature Monitoring with OneVue. 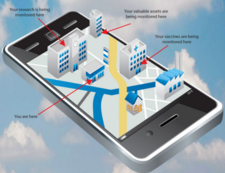 Environmental Monitoring Tailored to Meet your Needs. Testo Saveris 2 data logger system. No hassle temperature logs! Tutela Exhibiting at the AABB Annual Meeting: Tampa, Florida – October 22, 2014 –Join Tutela in Philadelphia October 25th through 28th for the AABB Annual Meeting. ADMA BioCenters (ADMA) has chosen Tutela Medical as the provider for their temperature monitoring needs.ADMA specializes in collecting human plasma for use in medications for disease control and prevention. 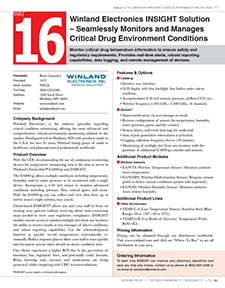 During an FDA audit, the FDA investigator suggested CTDN monitor room temperature supplises specifically to assure that blood collection tubes met storage requirements. With the addition of further monitoring points. The need to automate became clear. They evaluated various automated temperature monitoring systems an the market, and Tutela emerged as the clear leader. ImmunoTek BioCenters, a plasma collection organization, has chosen Tutela Medical as the provider for their temperature monitoring needs. ImmunoTek collects human blood plasma and operates multiple collection sites throughout the Southeast. Tutela is proud to announce the addition of Biotest Pharmaceuticals Corporation to its list of new customers. 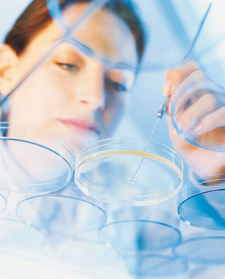 Biotest is a leader in the plasma collection industry and operates 18 sites across North America. 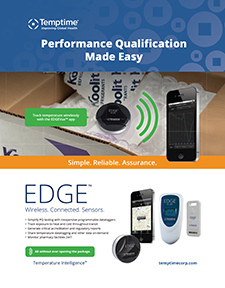 Cooper-Atkins new, easy-to-use, TransTrak Data Loggers are now available! 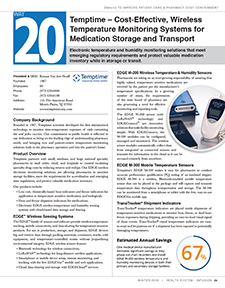 TransTrak temperature data loggers are most commonly used for monitoring storage temperatures during the transportation of blood, medication, food and reagents. 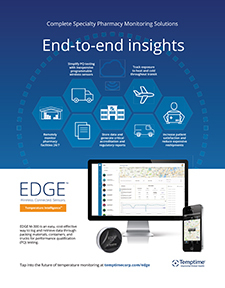 The TransTrak software records and stores data from each mission, providing highly accurate temperature results for laboratory, pharmacy, nursing and dietary departments. The compact data loggers meet AABB guidelines and are NIST traceable, logging up to 2,048 readings with user-programmable intervals. Each independent temperature logger comes with an ABS plastic bracket and stainless steel bead chain for easy mounting and is water-resistant.